← A simple life. For three weeks, anyway. As we traveled through Newfoundland, we didn’t do much shopping for gifts or souvenirs. But somehow, “The Hunky Dory” seemed like a great name for a shop, and the sign which read, “folkart and things” was just too good to pass up (“What things?” my kids wanted to know. Elephants? Paintings? Candy?). It turned out to be a great shop full of cool treasures like books and hand spun wool. But just as we were leaving, my husband spied the sign on the door. It said “Hours: 1-4 or by chance. If no one is here knock at the pretty house next door or look in the garden behind the shop.” Garden? Did someone say garden? I was out the door and down the hill before my husband could say, “Do you have the camera?” (I did.) What I found thrilled my inner gardener. 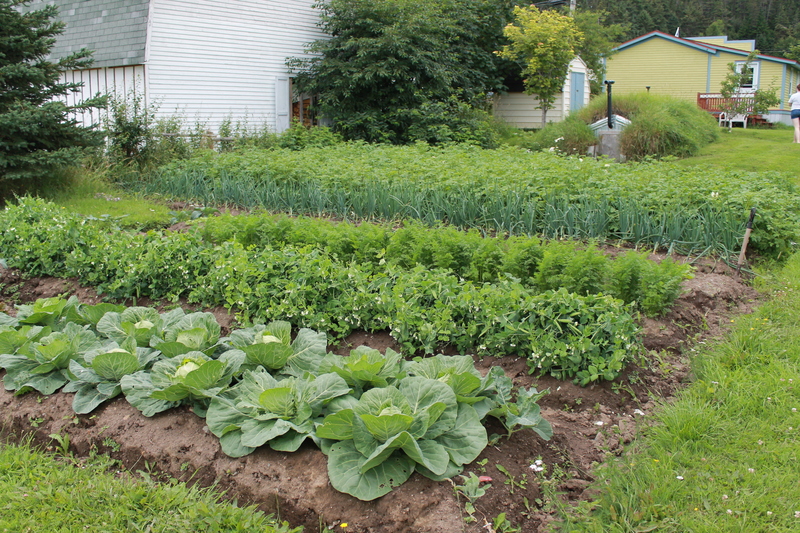 Charlie–shop owner and gardener extraordinaire–has a vegetable garden that was not just huge, but beautiful. Tidy raised rows were perfectly kept. The soil was dark and rich. His plants were thriving. He grew what everyone seems to grow in Newfoundland: potatoes (lots of potatoes! ), carrots, turnip and cabbage. He also had onions, peas and strawberries. Some years earlier he built a small greenhouse that grew tomatoes and a variety of herbs and not to far away there was a young apple tree with small fruit hanging from the branches. The newest addition was a large cold cellar that was halfway underground, with a mounded grass roof and shelves inside to keep his winter produce fresh. He still had a few turnip from last year, he said. There were chickens, too, which he got a couple of years ago after hearing about the fuss being made in Vancouver over chickens being kept in urban areas (no trouble with that here!). For all its beauty, everything Charlie was doing was practical. He grows food to eat, with extra to share. Last year, he said he had enough cabbage to give everyone in town a half a cabbage–which is good for two meals at least, according to Charlie. He is working within the limits of the local climate, which has long cold winters and cool summers. He also composts and feeds the chickens dandelions and other scraps. As beautiful as his garden was, it was his enthusiasm that I loved best of all. He said that his wife was always after him because he was forever neglecting the store to work in the garden. And when he couldn’t be out in it, he would just sit looking out the window at it. Ah, yes. The passion of a gardener. I was glad to have an opportunity to visit Charlie and see his garden. It’s always good to have someone else appreciate your handiwork. His enthusiasm was infectious, too. I came home with new visions of how gorgeous a simple, rugged garden could be. 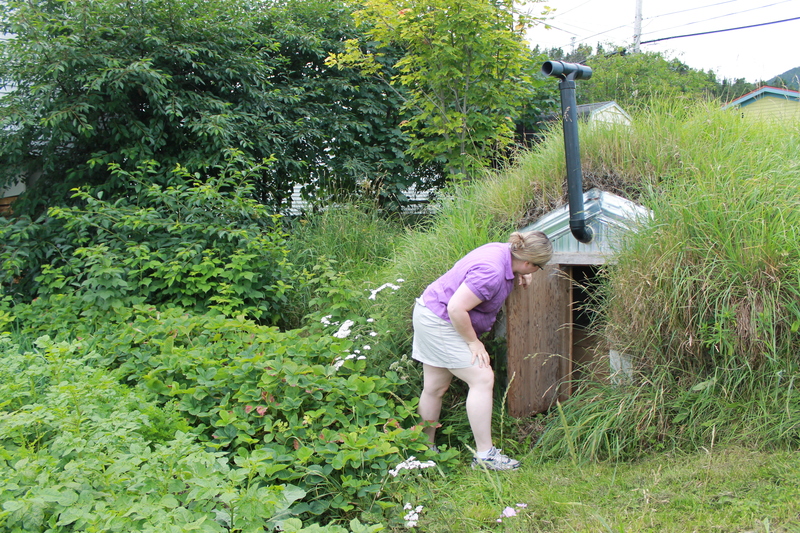 This entry was posted in Uncategorized and tagged gardening, Newfoundland, vegetable. Bookmark the permalink. Sounds marvelous Kristine….what fun to find an unexpected, inspiring treasure! Thanks for sharing. Happy to report that I’ve been eating fresh lettuce, carrot, cabbage , onion and potato for some time already! Gotta love it! Hey Charlie! I wish I was there to taste it for myself. Enjoy!